Published: Dec. 23, 2015 at 07:58 p.m. 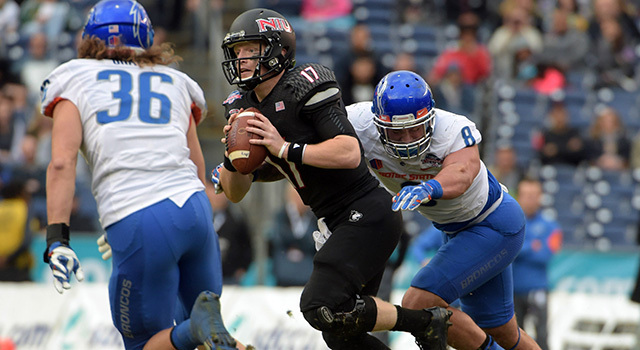 Updated: Dec. 24, 2015 at 09:49 a.m.
Kamalei Correa (8) and Tyler Gray (36) apply pressure on NIU QB Ryan Graham in the Poinsettia Bowl. I didn't know much about the Boise State junior linebacker before last week. However, after watching his tape I was very intrigued. He's extremely explosive, athletic and productive. His motor is outstanding, too. I was pumped to see him play live at the Poinsettia Bowl and he didn't disappoint with his performance. He showed the ability to set the edge in the run game and he generated a lot of pressure, including multiple sacks. Boise State moves him around on obvious passing downs, allowing him to pick a rush lane and cut it loose. 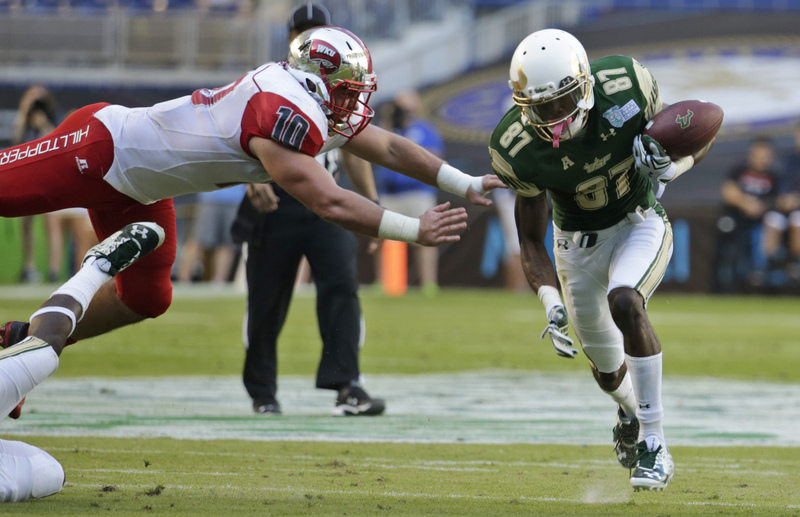 He isn't a polished technician as a pass rusher, but he gets by on pure speed and agility. Once he learns to consistently use his hands, he'll take his game to a whole new level. Correa said on Wednesday that he has yet to make a decision about whether to apply for early entry into the 2016 NFL Draft. Thompson has been an extremely productive player during his career at Boise State. He lacks ideal speed and explosiveness, but he has good instincts and he's aggressive to fill the alley against the run. This wasn't a great game to evaluate his skills because of the limited passing attack he was facing. He does show some stiffness in space, but he showed up against the run, including an impressive tackle for loss in the third quarter. I'll be anxious to see how he performs at the Reese's Senior Bowl, which the safety has already accepted an invitation to participate at. Gray wasn't really on my radar prior to this bowl game. The teams I spoke to had free-agent grades on him and didn't think he had much pro upside. However, he was ultra productive in this game. In the first half alone, he had a sack, forced fumble, two fumble recoveries and a tackle for loss. He has enough size and agility to warrant further study. I look forward to digging a little deeper on his tape.